At least that's what the baby is doing on the floor, wrestling a water bottle into submission and kicking her heels while I try to get down some of what's been happening. She is supposed to be asleep, but she's motorboating instead. First off, precious little knitting. I wish I could make a little sped-up video of me casting on, trying to work, ripping out, and repeating over and over and over again. That's what it feels like I've been doing. 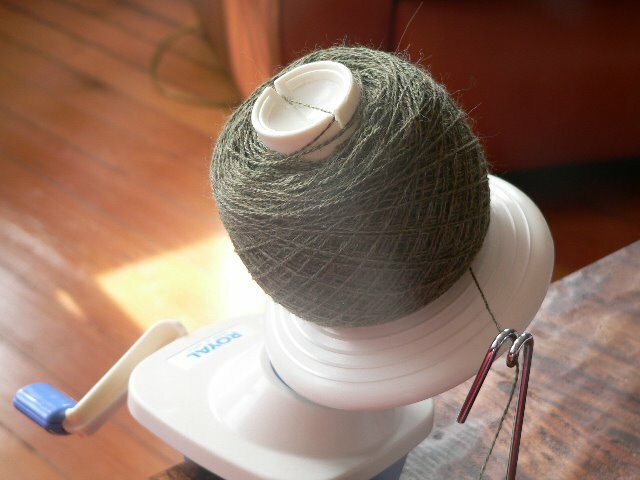 One of the reasons I finally began blogging was to prioritize my knitting, to make it important in an external, as well as internal way. I also wanted some incentive to make more finished products. Therefore, I made a mental note to try to always have a pair of socks, a sweater, and a something lacy on the needles. [This does not count the things that have languished half-finished for over 6 months.] I've been knitting for years, years, I tell you -- albeit until three years ago rather intermittently. 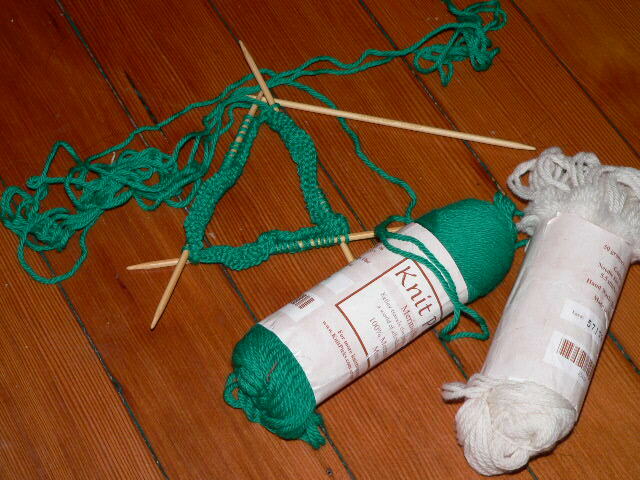 I read blogs of people who have just started knitting (it seems) and they just intuitively "get it." They churn out lovely product after lovely product, and I'm ripping out as much as I'm making. Frustrating. I know envy is counterproductive, and I do enjoy the process of knitting, but I enjoy it when it is process, not effort for no reason. I'm not interested in simply swatching to no end. At least that's how I'm feeling tonight. It's been raining. Maybe that has something to do with it. So I figured I'd make a pair of Jaywalkers. It seems that everyone else in blogland has. They're obviously not beyond my reach, right? Well, three times 'round now, I've started with 76 stitches, and after one round of pattern, ended up with either four extra stitches or three too few stitches, depending on how you look at it. Instead of weeping with frustration, I thought I'd ask here. Has anyone else had this problem? Help! Help! Nice yarn, huh? It's Lorna's Laces, in a colorway called Opal something or something Opal. They'll be lovely if I ever make them. I may end up emailing poor Grumperina and asking, or going over to the Knitty boards and asking. 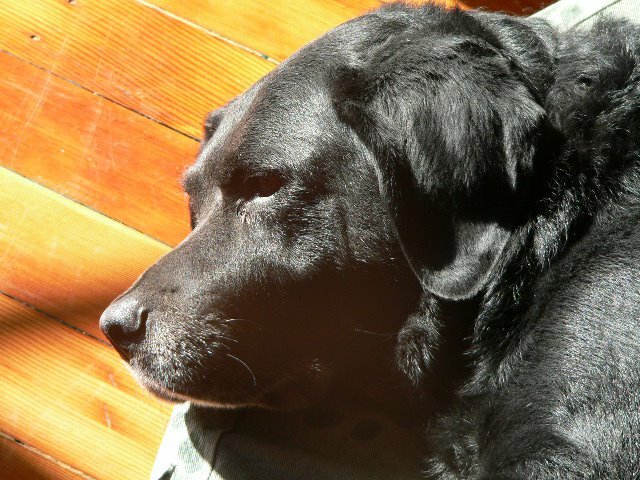 Or I might try it again -- tomorrow is the day the Sainted Miguel comes for a bit, and I may have time. It kills me that this isn't working. I feel as though I'm just, well, dumb. 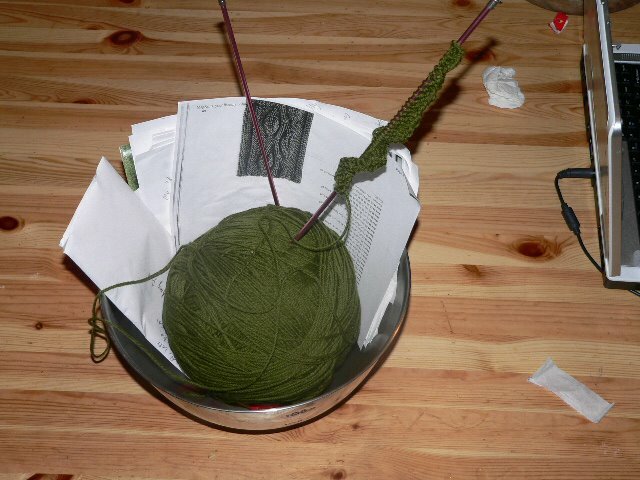 So I decided to finally begin working up a sweater that Thing 1 has requested ever since I can remember: a cabled sweater with leaves, in green. I got books made notes and measurements, and got this far: I think I'm going to love this project, IF I ever get it arranged. 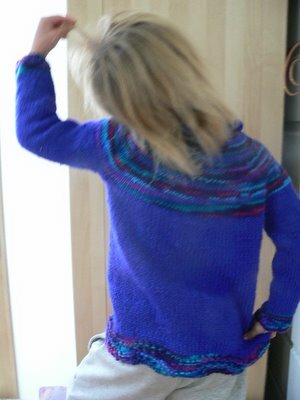 Pretty wool, pretty patterns, the possibility it will look just fabulous on the wearer. 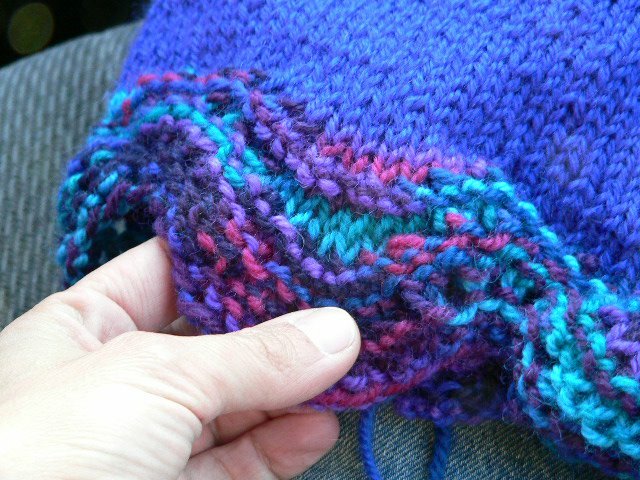 I even learned how to purl without bringing the yarn forward, which makes seed stitch panels a distinct possibility. Meanwhile, the household continues to obstacalize (if that's not a word, it should be) my knitting. The spouse is very sick, despite badgering a doctor into prescribing antibiotics sight unseen -- a very impressive feat! The kids are. . . well, they're my kids, and that's just the way it goes. Fortunately, I'm well, and have that, plus myriad other things, to be thankful for. I'm starting to wonder what else I can give up to free up more time to knit. I tried to bring up an old small playpen to put Thing 4 in so I could stop sweeping, but we couldn't get it set up. It's probably a good thing, really. It's only six inches off the ground, and that's only a day or two without sweeping's worth. Thing 3 is leaping around on my bed, jostling his sister who is trying to use the digital camera to take pictures of her origami whale (displayed on her bedroom door with lots of superflous glue around it. Yippee). All this while I attempt to type and load pictures. It's not always this bad, but this is not an unusually bizarre day. 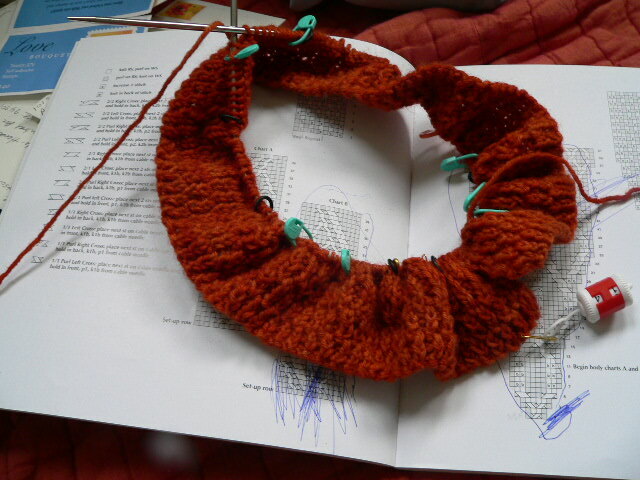 I am quite unhappy with my short rows, despite nona's fabulous tutorial. Clearly I must practice. One of the underarm grafts looks a little bit like the results of enthusiastic but decidedly amateur plastic surgery. I'm going to rely on the inherent cuteness of my kid and the frenetic pace at which she generally moves to disguise the lumpiness. Or else I'll do a lot of nagging at her to put her arm down, for Pete's sake! The baby Thing apparently heard my teeth-gnashing and has put in a couple of nights of "consecutive hours in a row" kind of sleep, my spouse is doing laundry in addition to working hard so I have time and money to knit, I've managed to knit an entire repeat of "Dainty Bess" without muffing it up, and things are looking up. 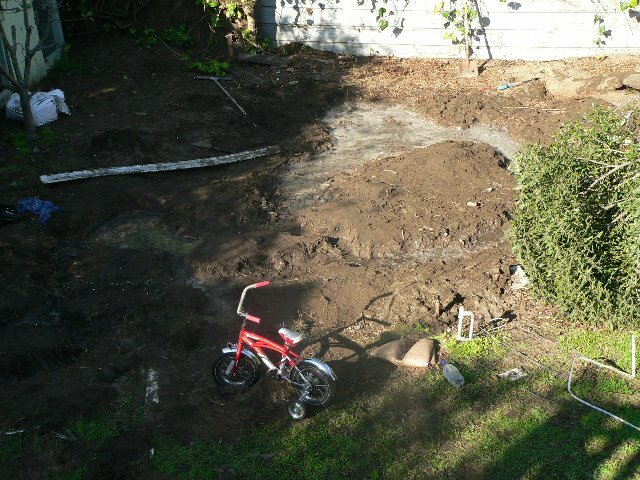 Oh, and the tree is mostly out of the back yard, leaving more room for island excavation. I think the Phillipines are going in next. *Project specs: Solid yarn is BaaBaaJoe's Woolpak 10 ply #34, Royal Blue, and the kind of flashy/pooly vareigated is Manukau Yarns "Charisma" 8 ply double knit, color 0958. 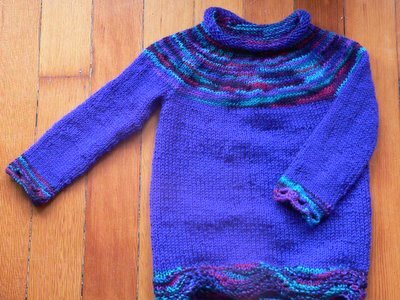 Main part knit on 8s, loosely based on the round yoke sweater from The Knitter's Handy Book of Sweater Patterns. I modified randomly as I went, but really, how much can you do to a classsic sweater shape? According to the American Farmland Trust, topsoil depletion is a serious problem for U.S. agriculture. Although it's a quieter problem than, say, war, losing topsoil faster than it's being created has serious, long-term implications. Goodness knows, I hope that the current war, at least, doesn't last as long as agriculture. While I can't do much globally, I can support farmers who grow organically and practice good topsoil conservation, and support groups who work to change agricultural practices toward more sustainable models. This is a worldwide problem, so no matter where you are, there are local ways to help. However, in my corner of the world, I know where the topsoil is going. That's separate from the portion that is going down the drain from the washing machine, and the portion I'm sweeping up in unconscionably frequent intervals from my floor, and the portion the baby is probably ingesting while sliming across the floor. Why, you ask, is so much of this nice sandy loam (when I garden -- if I ever garden again -- it feels like soft cake crumbs. This is niiiiice soil) now in my house, rather than in my back yard? The answer, according to the Things, is Japan and the Koreas. And while I have to laugh and give them points for a) knowing that Japan is a series of islands and b) that the Koreas are, first, two, and second, near Japan, their geography is still a little off. See? Neither North nor South Korea is actually an island. Never mind that Asia isn't actually in my yard, either. For my little hydraulic engineers/mapmakers, those are the countries they've created. Digging, planning, naming, riding their bikes through, and generally enjoying the Far East outside is buying me loads of knitting time. Time which, it is true, I pay for in sweeping and mopping, but stitches on the needles nonetheless. Which leads me to my Theory of Sweater Hatred. 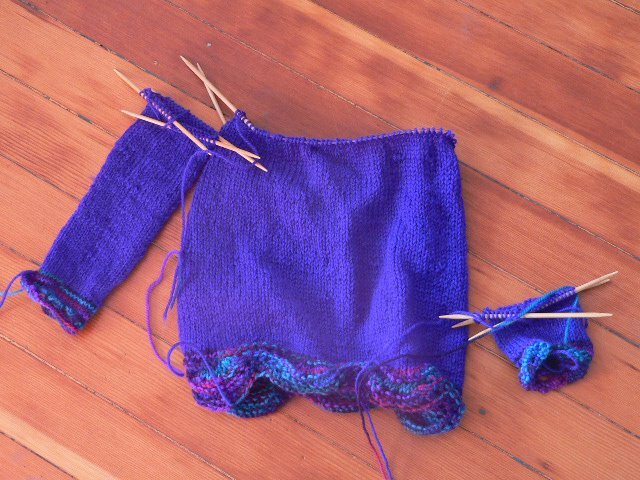 I like the planning of a sweater, like swatching and choosing yarn, starting it. Heck, I really like talking about it. And I like knitting it. Up to a point. That point being when I have completed 1.3 sleeves. 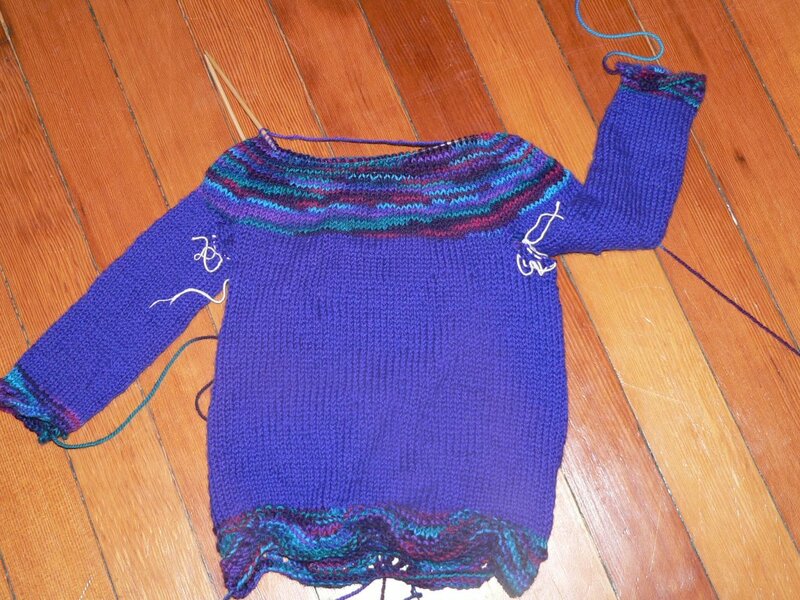 Then I begin to resent the sweater. Dully at first, maturing into a white-hot loathing when it becomes clear that no matter how much I talk about a sweater, nothing will finish it until I pick up the needles and knit it done. Because this is a round-yoked sweater, I'm hating ahead of time, because that yoke is going to take more time than usual. See how sneaky they can be? The variegated yarn should hold my interest. Fortunately, mothering has lowered my excitement threshold considerably. "Ooooh, magenta! Blue! Now it's purple!" I really want to get that sweater done. It doesn't matter what the sweater is, I haven't ever wanted one to take longer than it did. Partially I'm impatient to see if my vision worked, if it's a design I made up myself. Partially I want to get on to the next project. Partially I want the pleasure of seeing it draped around the recipient. If it's one of the Things getting it, I want to see how long it lasts before it's unceremoniously dropped on the floor. Some days, life at home reminds me of graduate school. Those late-night philosophical discussions, endless cups of cocoa-laced coffee, roaming the library stacks. . .
Oh, that's not it. What does bring to mind my years in school is the nagging, insistent feeling that there is always something that I ought to be doing. Something more deserving of my time, whether I'm sleeping, eating, sweeping the floor, collapsing in frustration, or heaven forbid, knitting. Plus the ever-present vague level of exhaustion. Of course, now that's because small children wake me every night; then it was because I just stayed up late for reasons of my own. 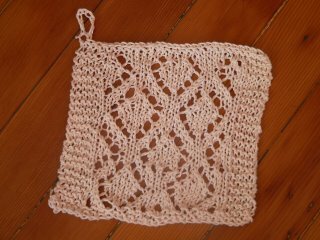 I've been practicing the pattern for my knitting olympics entry: "Dainty Bess," on some cream-colored kitchen cotton-type yarn. I figured that if I did it in a form I could see, perhaps I could unlock some of the mysteries of matched decreases and YOs. It helped some. It looks fairly lumpy, and I'm not going to try to block it. 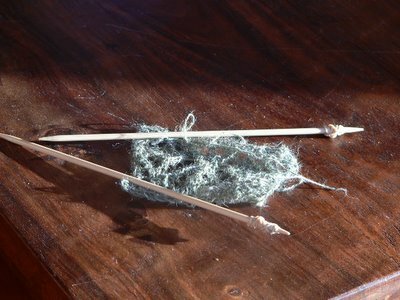 I still make many mistakes, some out of inattention, and some seemingly because little fairies invade my head every time I pick up knitting needles. As I knit, this odd sensation sneaks up on me, as though the instructions are sliding off some nonstick coating section in my brain. What's most astonishing to me is that intellectually, I have this stuff down. I understand the theory completely. I can see how the patterns work, I can explain it to others. Practice? Ah, well, that's where things get sticky. A friend told me that no one with small children has "lace brain." I know this isn't true, because there are knitters with small children (even the homeschooled variety) who knit lace. Maybe it's just me. 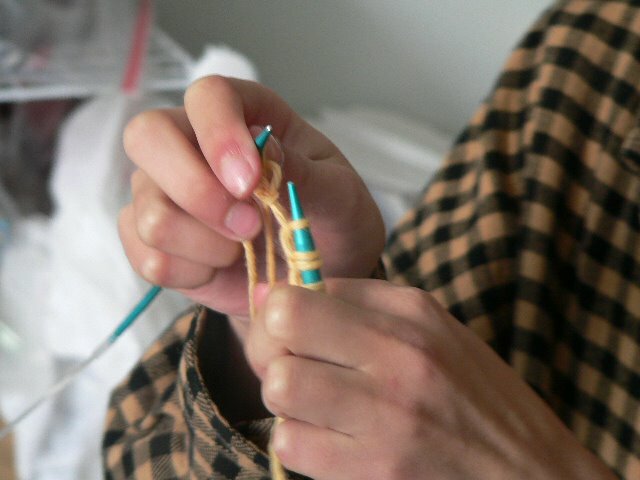 Yesterday was the first day of the reinvigorated "Knitting as a Spiritual Practice" group at my chuch. I don't know what I envisioned -- would everyone be knitting prayer shawls to selflessly give away? 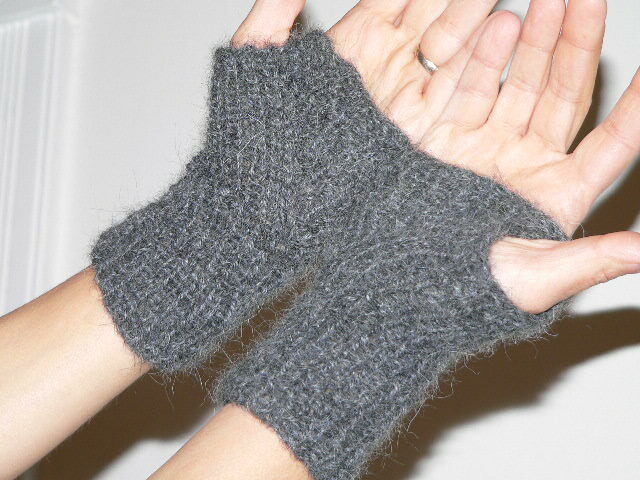 I knew what I would do with an hour of quiet knitting -- yes! the Clock Vest would come with me. Three whole rows of mistake-free (with a little work) vest came home with me. This despite the lack of quiet contemplation. One knitter seemed to need to talk. 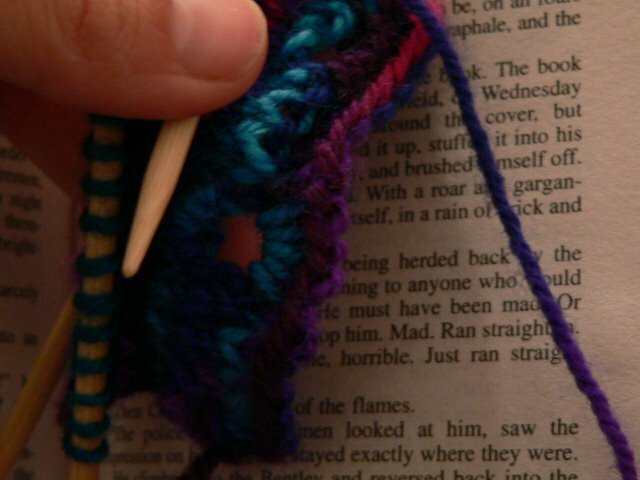 At first, I was a little tired of it, but then I realized that maybe she needed me to listen to her more than I needed to knit silently. A couple more knitters joined us, one with a prayer shawl. The talking knitter had already told me how much it meant when she got a prayer shawl when she was in the hospital. Apparently I was meant to listen and maybe learn just a little bit, with work on the vest being a gracious bonus. As I biked home, I looked forward to getting back to my busy household. The truth is, there really is too much to do at home. That's the nature of small children and a house and a sheddy dog. 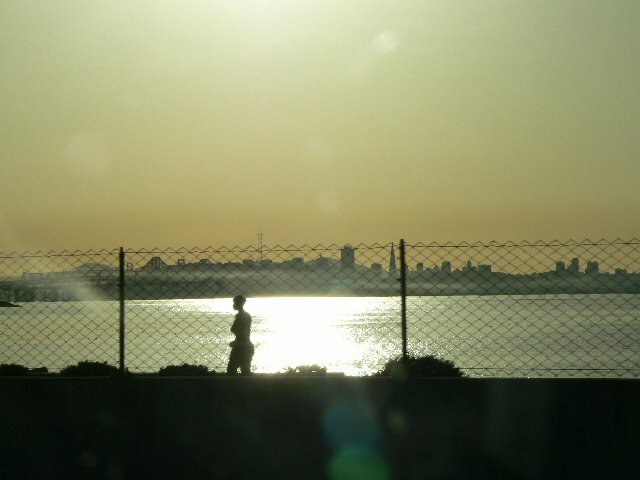 I do what I can, with a weather eye toward whatever serenity I can muster. And sometimes, all I need is a change of perspective. A lumpy swatch can, with the addition of a small chain, become a washcloth. Although I don't usually ever knit washcloths, if I add some gorgeous handmade soap, then next Christmas is taken care of for lots of friends and family, depending on how many times I swatch. I'm ahead! Children can expose the least savory aspects of one's character. At least mine can. From the ordinary: the baby inevitably creeps under the one piece of furniture I haven't gotten the dog hair swept up from, to the really rotten: I become a fiend if I can't concentrate at least once daily on something without little people talking to at me. Yesterday was the debut of Naptime is for Knitting. What is this daily exercise? Well, we get up every morning, eat, do "morning pick-up" (they pick up, I sweep, so the baby won't ingest an entire puppy's worth of dog hair), then we do our schoolwork and any errands. But. 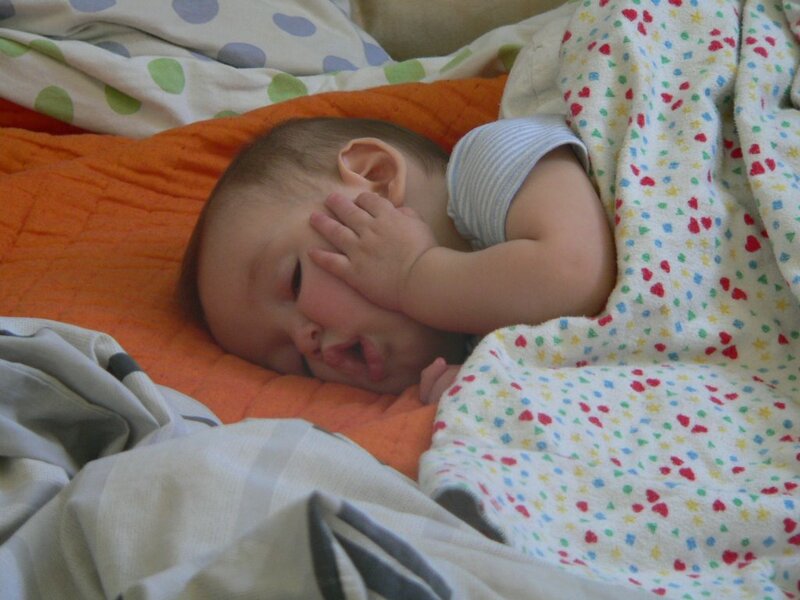 . . once that sweet little baby naps, all the three older ones are hustled into the back yard, with a timer, weather-appropriate clothing, and strict instructions to Get Along and Don't Come Inside Until the Timer Goes Off, Understand? As you can see, I'm still making mistakes. As you can't see (unless you own the patterns), it's not "Glorianna." It's "Dainty Bess." Apparently my brain can't do the former, only (partially) the latter. I plan to face up to my YO problems along the way. 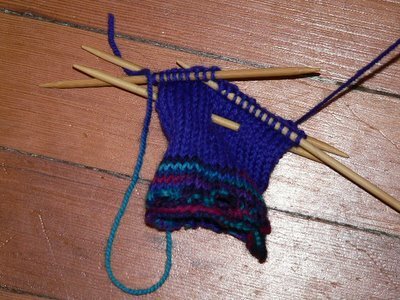 I decided during my first swatch, the one I threw away, that it was probably the needles. I tried every US size 5 needle I owned, and ended up with the improvised ones you see in the picture. 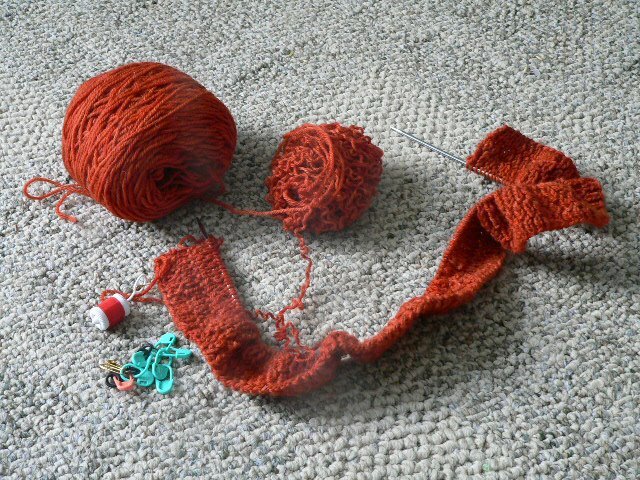 I considered that the problem might be my relationship with the yarn, but that a lace scarf in worsted weight wool probably wouldn't have the same effect. It's still probably an Olympic effort from me, considering the aforementioned YO impairment I seem to knit under, but not what I planned at all. Then I decided the problem was the pattern, and I may be getting closer. We'll see how it all works out. Oh, and I've used my graciousness in not running out to buy new, short, straight, bamboo US size 5 needles as a reason to seriously consider buying more blocking pins. 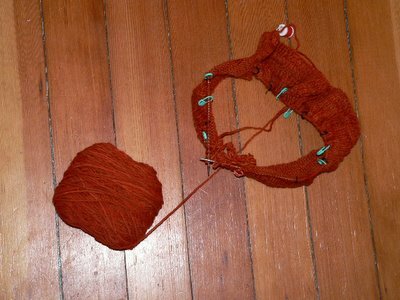 Swatching for the lace scarf last night did Not Go Well. 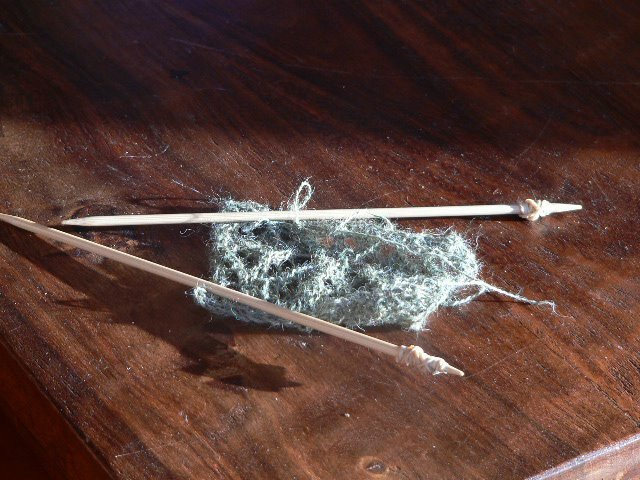 Heck, winding the yarn didn't go well. The swift is AWOL, and all of the children claim innocence. I have my doubts. I don't even have the energy to post a picture. All I can say, is if this doesn't get better, the Knitting Olympics is going to be more of a challenge than I'd figured. Obligatory Olympic Parallel: imagine a snowboarder in a heap, crumpled board beside her. That was me, lacewieght yarn and size 5 US needles in hand. Tonight's another go, I guess. You may know that, really, it’s just the same as big straight needles in theory, but the commenters don’t. I get the same feedback sometimes for something I do as a matter of course, and have for years. 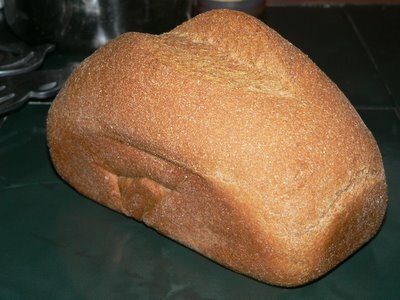 Witness, truly nice 100% whole wheat bread. My children, never having known any differently, just assume that bread will leap out of the oven at regular intervals, and they love to help make it. I like it this way. It’s a part of life that’s truly normal, nothing special, but at the same time, it’s a thing of wonder. Yeast! Water! Flour! Salt! Butter! A little technique and time -- Bread! 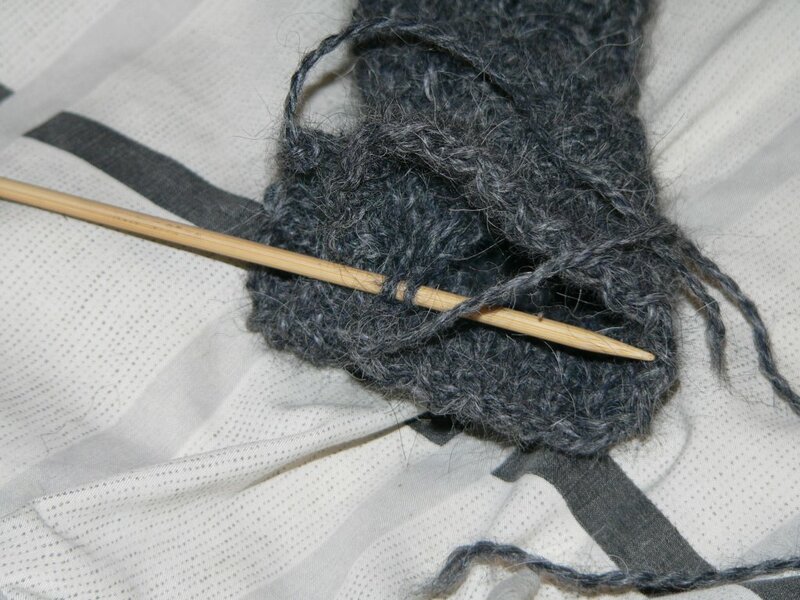 Knitting isn’t as effortless or rapidly rewarding. It’s easy to screw up, and I can’t even eat my mistakes. On the other hand, you can’t unravel a bad loaf of bread. My difficulty in following the simplest of directions cost me in precious time today. Miguel, the WonderSitter, was with the larger Things for a couple of hours today. The baby Thing was with me, napping like she was born to it snuggled up in her carseat. 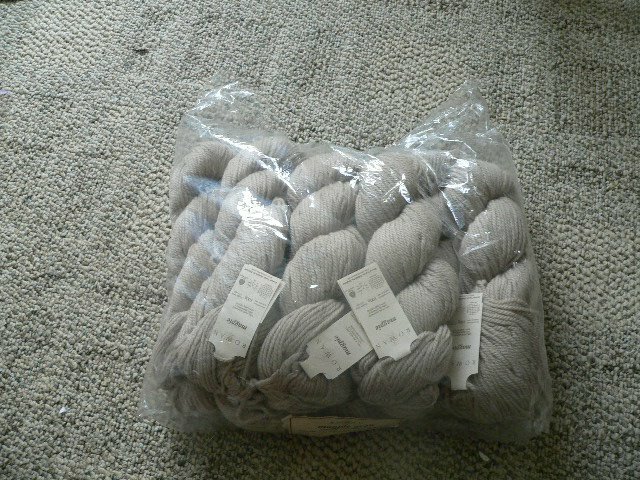 After running the typical “mom with babysitter” errands, I headed over to the yarn store. Because it’s a haven of peace and tranquility, compared to my house, I pulled out the Clock Vest again, determined to get it right. Even in what were near-ideal circumstances (yarn everywhere, supportive people, expert help), I managed to knit, un-knit, and re-knit every single stitch for two rows. I read a chart the wrong way. I performed cable crosses perfectly, but on the wrong row. I purled where I should have knitted, and knitted when purling was called for. And yet? I got two more rows done. 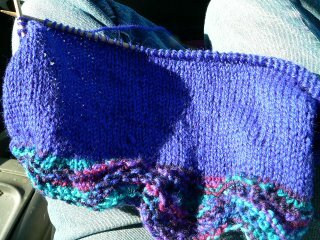 Well, according to the mileage, it was more like five rows, but I walked off with a vest two rows closer to being done. It may take more or less forever, but I’d rather do it right. I’d rather not mess it up every time, too, so that’s where the Crazy Lady talking to myself paragraph instructions come in. 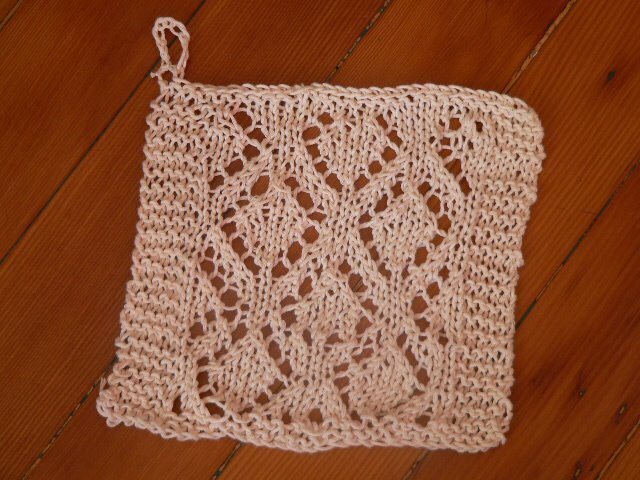 I’m going to be using them a lot, because I’ve decided to knit "Gloriana"” by JoLean Treace for the Knitter’s Olympics that the Harlot dreamed up. You know it’s going to be a challenge for me, simply because it will require more thought than just knitting in the round. But hey? Sixteen days, I can so do it. The kids are young. They'll remember it as sixteen days they spent a lot of time with Miguel, not sixteen days of their mother muttering crazily in her chair, furiously trying to finish a simple lace scarf before the Olympic flame is extinguished. Even though it doesn't really snow here (one year was memorable for the great hailstorm that lasted about 15 minutes), I think I know what it feels like. -- who knows if or when it will stick, or not. And, before the Great Cold Virus struck too virulently, I was sitting quietly during piano lessons and working away at that mis-frogged cable. Halfway through, I had a thought that could roughly be translated as "Screw this!" 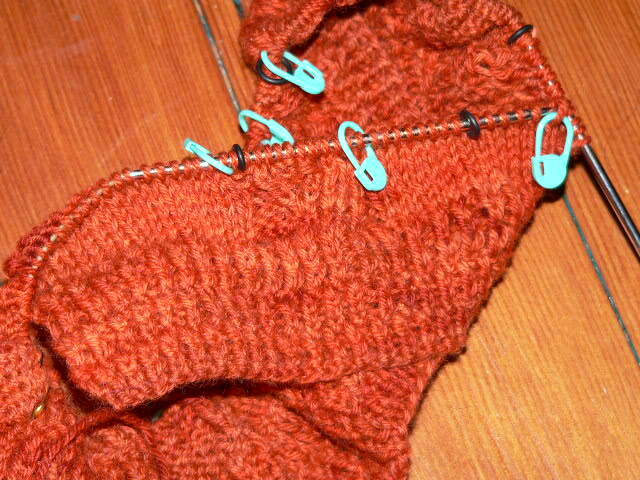 and pulled everything out, back to the end of the ribbing. Notice the sad pile of stitch markers? I just thought, "This is something I'm making for me (as opposed to a fast-moving small child), and I want to enjoy it for a long, long time. I'm going to be happier with it if it's right, and now I've learned what I did wrong the first time, so I might as well just. . . rip it." Eight skeins of discontinued Rowan Magpie, in Tranquil (snort, snort, yeah, right). Maybe if I ever finish the orange vest, I'll reward myself with a nice complex, slimline Aran. Goodness knows I can always rip it out until I get it right. When I imagined having a family, I knew it would sometimes be hard. But I think I meant "hard" in the sense of, oh, say, an Old Order Amish barn raising. Lots of hard work, shared by cheerful people encouraging each other. Maybe they would sing songs. And at the end of it, you'd have a barn grown children. And when it wasn't like that, I expected something like a hippie tea party -- creative play, wholesome food. In general, I expected that the children would be basically cheerful and cooperative, and the adults would be wise and patient, probably kind of funny. We'd all rub along pretty well together. It's not quite like that here. It's hard. By "hard" I mean something like a movie with galley slaves chained in the dank hold of a ship, and large pirate-types wielding whips and shouting, "Faster! Faster!" as the oars are moved back and forth. At least, that's what it felt like at 3:00 a.m., when the quite sad fussy baby could only sleep if I sat up and held her with her lovely little head tucked under my chin while she cried and cried, feeling stuffy and rotten. Then Thing 3 developed a rollicking ear infection -- both ears this time -- about 4:15 today, too late to crash the pediatrician's office for "just in case" meds. I unpacked all of my home remedies and he's going up and down, but I anticipate a wild night again. The only part that resembles my hippie tea party fantasy comes when I gather up enough laundry to do a load every 2.5 hours, and realize that someone is getting naked a lot. 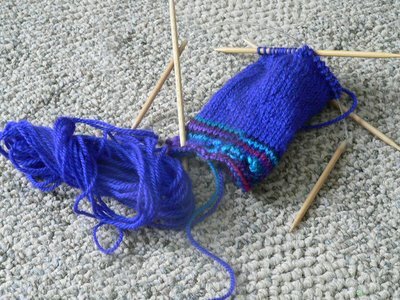 Needless to say, even when the knitting is simple, there's not a heck of a lot of it getting done. And when it's more complex? Well, remember how excited I was about redoing that cable? And I was so thrilled I realized that I could redo the center cable too? So I was sitting in a quiet moment and thought, "Okay -- let's do it." And I boldly ripped back the rows, consulted the charts, counted the floats, and looked at it. Then I looked at it again. Hmmm. The stitch pattern appeared to be off compared to the center cable chart. 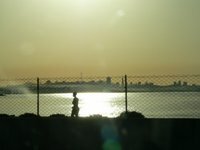 I looked again. The floats looked. . .familiar. I had re-ripped the already re-done cable. At least I know that I can fix it, since I've done it once. "Stroke! Stroke! Faster! Faster" I can hear it now. Whoo-eee. Look at the time stamp on this baby, won't you? This is what comes of small children with colds. And after an hour of patting, singing, those funny middle-of-the-wee-hours conversations I imagine most parents have ("Do you think Cameron would like some referrals? What is 'probate,' exactly? "), wielding the device affectionately known around here as the Brain Sucker, and nursing more times than I can count, I finally gave in, wrote off sleep for the night, and turned on the light. Fortunately I was near the end of a passable book (Good Omens by Terry Pratchett and someone else, Niel someone.) Don't read it unless you have more time than you need, though. . .
At any rate, I just surrendered. Gave the littlest Thing a toy, started reading and patting and singing, but without that edge of "hurry up and go to sleep" to it, and just, well, was. And now she's asleep, and they're all asleep, and I'm going to be asleep for as long as is allotted to me, and that's okay. I'll be tired, but no more than I would have if I'd fought it, and some day it will all be a dim memory. But the edges on the sleeves for that sweater won't. No, I don't do the driving! 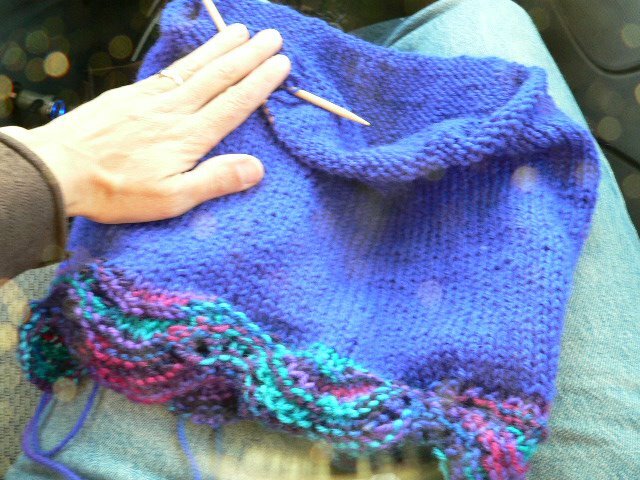 But, since home is full of the distractions generated by four children, being a passenger in a car is the perfect opportunity to get some uninterrupted time in on the needles. I think it's because they're all strapped into car seats. I am fairly pleased with my partially-garter stitch scallops for the edge. Not completely, but I'm willing to go with them and see how they work. A big shout to Janis for not adding "Duh!" when she suggested I try changing them a bit. So it wasn't really that funny a day, if by "funny," you mean, "bickering children, crabby mother." It was pretty peaceful. And, oddly, quite pleasant. 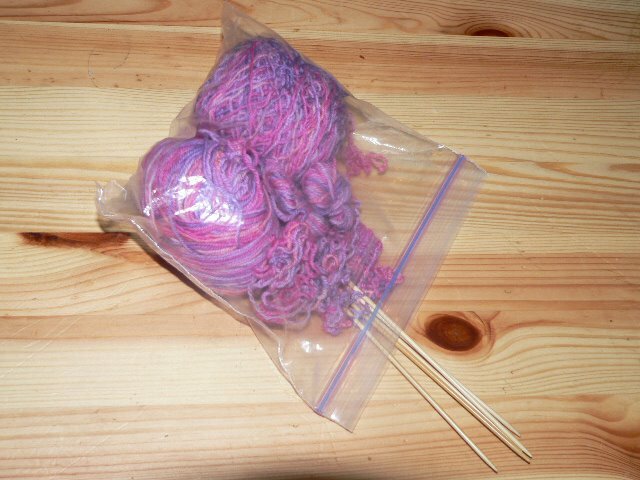 I dressed my knitting bag in layers today. Since we were heading to the park for our weekly homeschool get-together, there were a few principles to pack by. It's just like making certain that everyone has a backup sweater in the car. You just never know. Someone might hold the baby if she slept. I might get some help on the sticky parts of my Clock Vest. I would want some easy knitting in case the sleeping baby thing didn't happen. And, I should probably finish that dratted mittlet. Last night I noticed that one of the cables on the vest had gotten wonky. Just something odd. Then, I notied that the central cable, while a thing of beauty, might have, you know, just moved one stitch to the side. I tried to tell myself that I could manage that, and just ignore it and reshape the shoulders to accomodate that later on. But, I also cast on a simple little baby hat, in Knit Picks Merino Style, for the teeny little guy born to my neighbors. I figured a little color work would keep me from gnashing my teeth in boredom, and some simplicity would help me not make a complete hash of it, as I have clearly wandered into some Bad Knitting place. I haven't yet chosen the colorwork pattern, but I'm thinking. I wish I could do teeny seahorses, because his name translates as "seahorse," but the gauge is too big. Back at the park, however, the baby I carry around did fall asleep, and there are enough post-small-children mothers there that I practically get a line of people saying, "Sleeping baby? Yes! I will hold." They clearly remember their children's babyhoods well, though, as any child is better asleep. So I whipped out the troublesome vest, and with the moral support and chart holding of my friend Jenny, ripped back five rows of the Bad Cable A and reknit it while she talked me through it. Gratifyingly enough, she did murmur things like, "I would be in tears by now" as I said, "Now, which way does that stitch go? Front? Back?" over and over again. The neat part is that I did it. Really and truly -- yanked those puppies out and redid them, made them behave and everything. But you know what the best part of it was? I was knitting in a circle of, oh, conservatively, twenty, women, and all but maybe four were knitting away. It's not a knitting group. Knitting just happens there as a side effect of being together with not a lot to do for about three or four hours every week. But, two years ago, I was the Lone Knitter at the group. Some of the women knew how to knit, some had even learned from their mothers or grandmothers. Yet, no one knit. Ever. Well, I did. And it was weird, at first. Sort of like having a vaguely embarassing disorder. They were. . . polite . . . about it. One said she'd really rather quilt. Others just weren't at all interested. I didn't talk about it (too much). Then. . . someone showed up with a novelty yarn scarf. Someone sheepishly asked if I could show them how to bind off. Someone brought yarn and let others fondle it. As though it was the most natural thing in the world, nearly all of them picked up needles and started to do their own thing. Some have pretty much stayed with little scarves. Some are getting completely inspired, whipping out socks and sweaters and lace and cables oh my. The holiday season was rife with knitted items showing up on doorsteps all over town. Just today, two new members, who haven't knitted before, shyly pulled out scarves they made, just to surprise me. Somehow, and just based on being first, I'm known as one of the "better knitters" in the group. I have evidence (had it there today, in fact) that if that's true, we're all in trouble. I still feel like I ought to live up to it, though. So today, I brought a little finishing needle to get the mittlets wearable. 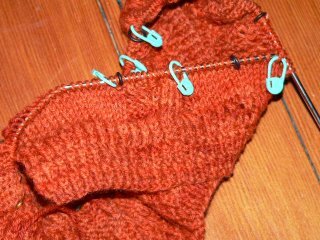 I pulled up the two dropped stitches and used the tail to secure them, figuring it's warmth, not art, where these are concerned. I turned the troublesome left one inside out and got all the ends squared away, then triumphantly turned to show them to my buddy. "See?" I squealed, "They've got these great gussets. . . oh no! I made two right ones again! Argh argh argh. Drat it." She looked at me sympathetically and I stomped off to stow them in my bag and pulled out the little baby hat. My baby, bless her, was still asleep. My friend made encouraging noises about the hat, but I wasn't listening. Finally, I looked her in the eyes and said, "Hold on." Looked at the repaired one. Turned it right side out. Hey, presto. Right and left. Not a lot of knitting activity today. In between holding the baby and chasing the others around, it seemed that every time I sat down to knit I was interrupted. What is it about the sight of a mother enjoying herself that triggers a hunger response in a child? I can't just knit on the Clock Vest, either. I have to think every pattern row through carefully, because as I've pointed out before, it's not the kind of sweater I can coast on. Not much reading during this one. So look at the earlier picture of the vest here and you'll pretty much know where I am now, barring a row or two. 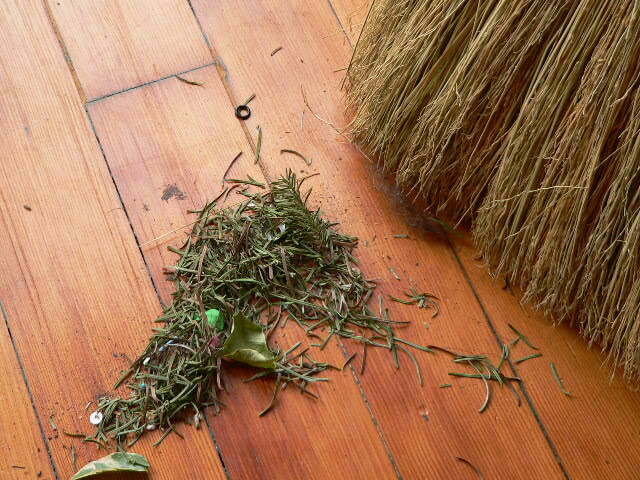 I did get the tree out of the living room and sweep up the evidence, including the ants that were after something under it. 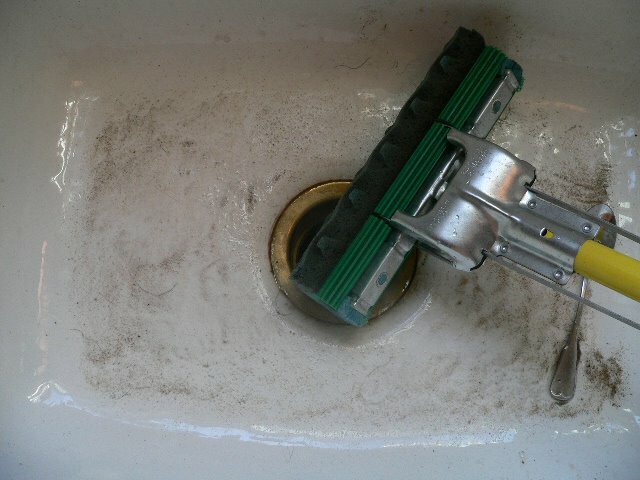 Notice the little o-ring marker in the sweepings? I shed markers like I'm deciduous. Next Christmas I'm asking Santa for a few packages. 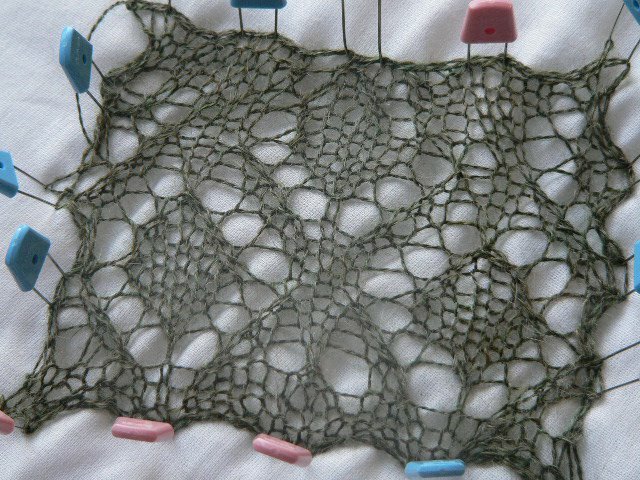 I like using all different kinds so I can differentiate between patterns, for example, rather than knitting pattern A for pattern B occasionally becoming a mite confused. And the tree is still down in the back. In the yard, but we didn't mean for it to, but we're really not sorry at all, is it wrong to celebrate? We've been having plenty of rain around here, and quite a bit of wind. We are grateful for our new roof, let me tell you. And how nice will it be when we've fixed all of our windows? By the time we're done stopping the drafts and reglazing the double-hung windows where that one is puddling and fixing the back door where rain blows into the house it will be very nice to have the drafts stopped, especially considering that we'll probably be quite elderly by then. So there is a large tree in the back yard. We don't have a huge yard; no one here does, but it's okay. And this tree wasn't really "planted" there, because it's more of a weed tree than a desirable tree. 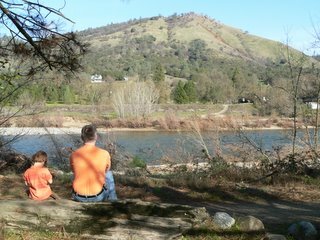 In my opinion, a tree is desirable if it's bearing fruit that I want to eat; in my children's opinion, a tree is desirable if it's a good one to climb. This tree did neither. While it was big, the crown grew thick with tiny branches. Even my skinny offspring couldn't really climb in it. I had thrown a rope over a small branch, and they worked out some (never, ever enough) of their extra energy swinging and spinning on that rope. We've been talking with friends who have a gardening business about a more unified plan for the yards -- we'd like them visually tied together and I would like them stuffed full of, well, edible things. 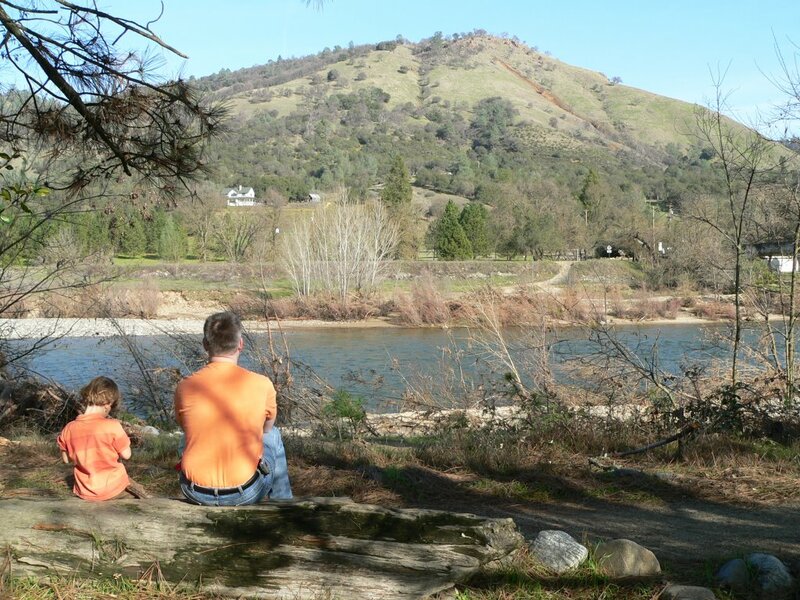 They strongly suggested removing this tree, and pointed out that it would grow 10 feet per year, eventually becoming even more overwhelming. All of the Things who can talk vociferously objected. I realized that replacing a tree with that much play value would take either a lot of time or a lot of money, so we'd agreed to work around it as long as there were any tree-climbing Things in the house. Soooooo. . . Thing 1 opened the door, and said, "Oh come and look!" 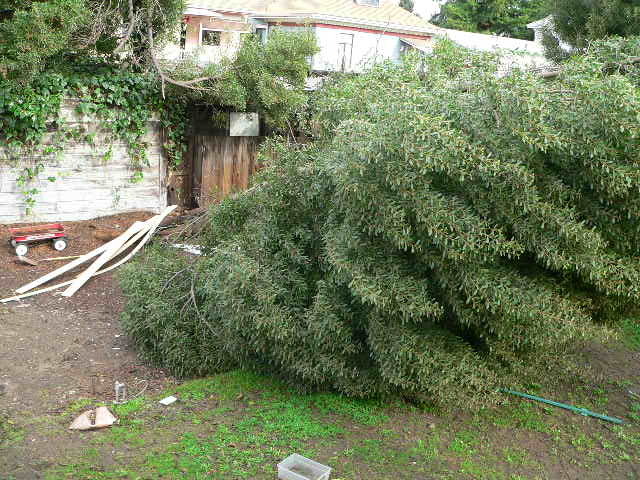 Sure enough, the tree was at about a 45 degree angle right down the open part of the yard. It was leaning directly in the line of the wind. The combination of soil saturation, crown density, and a piss-poor root system was enough. Over the course of the morning, it settled to its current position, from which it's not going to move without help. Now all we have to do is get it taken apart and taken away. Either that, or enjoy it through a few weeks of green recycling. I thought fitting our Christmas tree in the green bin was going to be interesting enough. While they spent about .09 seconds being sad about the rope, the kids discovered that running up a slanted tree trunk was pretty serious fun in and of itself. So while they do that, we can think of ways to play-enhance the yard without the tree. I had to smile. 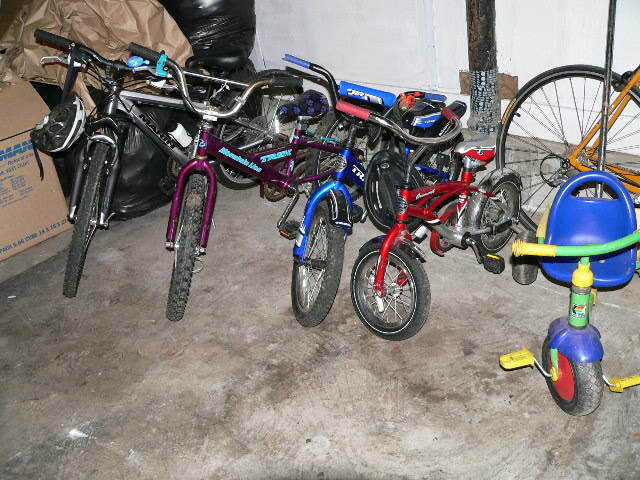 It looked like a convention of the Heck's Angels had rolled into the basement. I may not like them running amuck, but they are growing up. I have three, four, and two-wheeled evidence for it. If I decide not to cry, I may just draw them up and darn them in. Darn it, darn it, darn it.